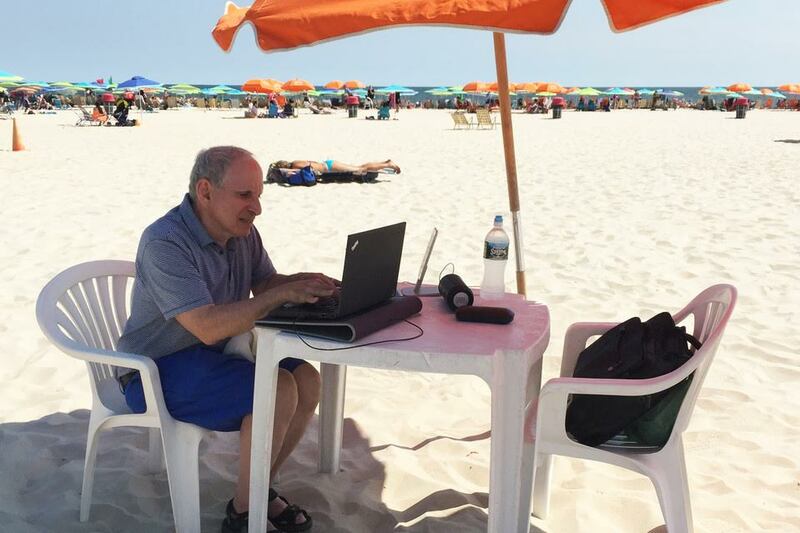 ATLANTIC BEACH, N.Y.—For most people, a cabana on the beach is the ultimate refuge from their office. For others, it is the office. Rhonda Levy, an artist and college graphic-arts professor from Far Rockaway, N.Y., gazes into her laptop as her daughter-in-law and two of her school-age grandchildren relax in bathing suits on a lounge chair behind her. A Sunny Atlantic Beach Club member for more than 15 years, Ms. Levy used to swim and relax. This stretch of Long Island is known for sandy beaches lined with cabanas, where people play cards, read or suntan. But now, beach clubs are expanding Wi-Fi and members are paying to install internet routers and phone lines in their cabanas to telecommute from the beach. 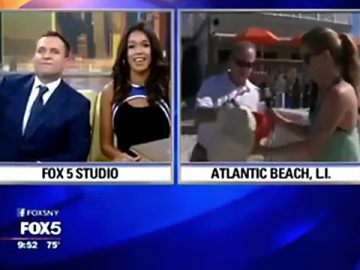 Beach clubs in New Jersey, Florida, California and other states see a similar trend. Sunny Atlantic has upgraded its free Wi-Fi three times in the past two years, partly in response to members who want to work. Club members pay a seasonal fee for cabanas—simple structures that typically include showers, refrigerators and a small patio. Cabana fees, which include club membership, range from $2,980 to more than $10,000 for the season for a 13-by-18-foot unit on the beach with an ocean view, says Howard Taub, managing partner of Sunny Atlantic. At least 20 of Sunny Atlantic’s 1,200 members work regularly from the club, he says. Neighboring Silver Point Beach Club installed Wi-Fi earlier this summer. “We were late coming to the game,” says William Baumert, the club’s general manager. That said, “the cabanas are right on top of each other. It’s not conducive” to working. 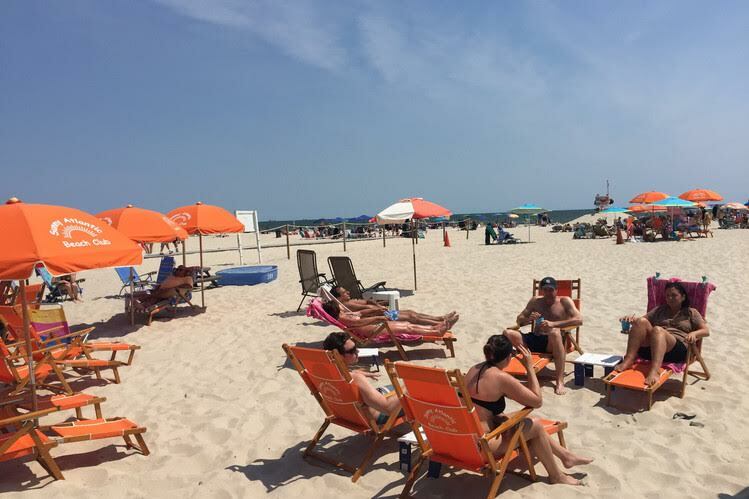 About 12 miles down the beach, at Silver Gull Beach Club in Breezy Point, N.Y., some members have pressed the club to extend its free Wi-Fi to the cabanas. But the cost would be too high and the maintenance too difficult, says Jamie Blatman, general manager. “We’re a beach club. We don’t have an IT department,” Mr. Blatman says. 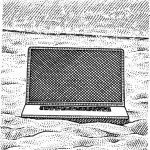 Accountant Eileen Goldwyn of Brooklyn sat perched on a chair outside her cabana at Silver Gull Beach Club one recent afternoon, peering into her laptop on a small table. She likes to get work done while her two children, Natalie, 7, and Zachary, 3, are taking part in a camp provided by the club from 12:30 p.m. to 4:30 p.m. She has sand vacuumed out of her laptop periodically. She recently had a landline installed in her cabana, as well as a router, so she wouldn’t have to run to the parking lot to take client calls any more. At Sunny Atlantic, Michael Kaplan checks the wind direction on a weather app on his phone each day. “Wind is from the southwest,” he said, on a recent day. “You don’t want to be here on a day when the wind is from the north.” A hot north wind off the mainland can turn his cabana workspace into a sauna, driving him out onto the open sand where the breeze is cooler. 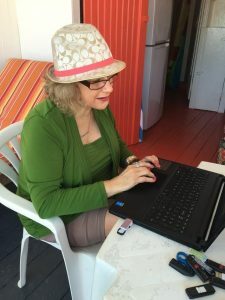 The public-relations consultant works six or more hours most summer days from a cabana hard-wired with two internet routers and a landline telephone. Mr. Kaplan pays about $80 a month for the service. Mr. Kaplan also uses two smartphones that double as internet hot spots. His laptop rests atop a cooling platform equipped with a fan. A floor-to-ceiling solar screen rolls down to block the morning sun. Mr. Kaplan was a member of a neighboring club, Silver Point Beach Club, before joining Sunny Atlantic two years ago. Another member complained after he had a landline installed in his cabana there, saying his landline buzzing and his taking calls on the beach was disturbing other members, he says. Mr. Kaplan left quietly, by mutual agreement with management. The club’s Mr. Baumert says he doesn’t recall the incident. Separated from Mr. Kaplan by a few feet and a wooden rail, Sasha Edgarov, a New York City entrepreneur who advises investors on international ventures in finance, commercial real estate and technology, works at the next cabana, reviewing deals and sharing documents with customers and business partners in the U.S., Israel and China via a hot spot, smartphone and laptop. Mr. Edgarov’s three sons, 11, 7 and 5, move in and out of the cabana often to fetch towels and snacks. “They make friends here. It opens up their horizons,” he says. He stops working every few minutes to talk or apply sunscreen. He and his wife, an attorney, work alternating days from the cabana, to be with their sons in the summer. Groups of friends stop by in twos or threes to chat; Mr. Edgarov offers cappuccinos and snacks. Mr. Edgarov has his cabana outfitted with a small espresso machine, toaster oven and a refrigerator stocked with high-quality tequila, rum, scotch and beer.